Here are the top highlights from Prime Minister Narendra Modi's Meerut rally. 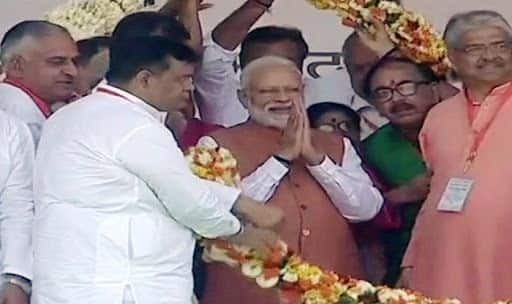 Meerut, UP: In a no holds barred attack on the Opposition and its ambitious Mahagathbandan, Prime Minister Narendra Modi at his Meerut rally on Thursday, fired salvos batting criticism over air strikes in Balakot to his recent national address on successful A-SAT test. Thereon, the Prime Minister unleashed a blistering attack on the NDA government critics and mimicked them over raising questions on the air strikes carried out against terror camps Pakistan’s Balakot and competing to win Islamabad’s affections. He also attacked the apparent formidable alliance of Samajwadi Party, Bahujan Samaj Party and Rashtriya Lok Dal in Uttar Pradesh and insinuated how former foes are now friends- only for greed of power. Hitting out at the Opposition for demanding proof of IAF strikes in Balakot, PM said, ”The Opposition is trying to be popular in Pakistan. Does the public want India’s hero or Pakistan’s? Do you want ‘saboot’ or ‘saput’. Further training his guns at those doubting the air strikes, PM Modi spoke on how the Opposition wants to only weaken the nation. “They ignored the air force’s requests. They didn’t provide bulletproof jackets to the army and also stopped scientists from launching anti-satellite missiles,” the Prime Minister exclaimed. “Samajwadi Party is against Muslims and Triple Talaq. People were forced to leave their home when Akhilesh Yadav-led party was in power,” PM Modi said in a stinging jibe at the SP.